A: As a prey animal, your horse is naturally cautious of the world around her. 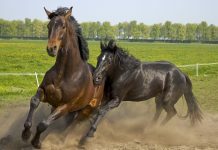 After all, horses have survived millions of years by relying on their flight or fight instincts. Horses are big chickens; they’d rather run from anything that frightens them than hang around and fight the perceived danger. Your job is to desensitize your horse to as many objects as you can. However, even if you spent every day desensitizing your horse to new objects, you’d never be able to familiarize her with everything. That’s why it’s important to know how to safely handle the situation when your horse does spook. Controlling your horse when she spooks under saddle is a matter of giving her a job to do and getting her to use the thinking side of her brain. When your horse spooks, she’s using the reactive side of her brain and reverting to her prey instincts. Mother Nature is telling her to run first and think later. The key to getting your horse to use the thinking side of her brain is to move her feet forward, backward, left and right. 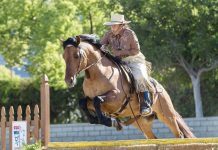 If your horse spooks and you feel like you’ve lost control, do a one-rein stop by quickly but gently pulling one rein up to your hip and holding it there until she stands still and softens to the rein pressure. Once you’re back in control, immediately put your horse’s feet to work, constantly changing directions. Jog serpentines, lope a figure eight, circle around trees on the trail, et cetera. It doesn’t matter how you make her move, just that you do it with energy and are constantly changing directions. The more changes of direction you do, the quicker your horse will relax and pay attention to you. When she’s soft and focused on you, go back to what you were doing. If your horse spooked at a specific object, use the opportunity to desensitize her to it. For example, let’s say your horse spooks at a sign. Rather than ignoring her behavior and letting it get worse, teach her that the sign is nothing to fear. Move her feet forward, backward, left and right in front of it. When a horse gets scared of an object under saddle, I love to do rollbacks in front of the object because it quickly gets the horse using the thinking side of his brain. You’ll use your horse’s fear of the object to get her to turn and roll back over her hocks. Each time she turns and rolls back, ride her closer to the object. Horses can only think about one thing at a time, so your horse will either be thinking about the sign or about moving her feet and paying attention to you. Eventually, she will realize that doing rollbacks is much harder than actually going by the sign and she’ll stop spooking at it. 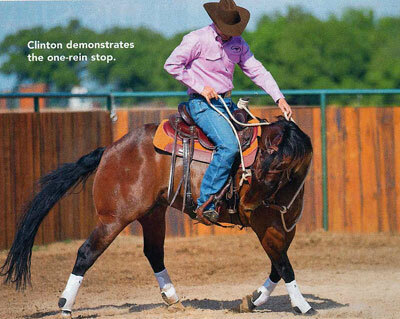 Clinician Clinton Anderson owns and operates Downunder Horsemanship in Stephenville, Texas, where his method of horsemanship has helped to transform the relationships between thousands of horses and riders. He also hosts two training programs that air weekly on Fox Sports Net and RFD-TV. www.downunderhorsemanship.com. This article originally appeared in the January 2012 issue of Horse Illustrated. Click here to subscribe. Good article and I sure hope it works. Good article and a lot of good tips. Keeping both sides of the brain working is a tricky thing to do, that made it easier. Thanks. I will have to give it a try…hope I can made both sides of my brain remember this article, when my filly spokes. Please help them out, they want 2 open a slaughter house here in New Mexico. We don’t want it any where,4 food PLEASE someone with the backup stop the madness. POST AND SHARE. What is a roll back? My horse spooks easily also.